GOODE now offering PowerShell boots with Reflex mechanical release system. GOODE Skis and Reflex have partnered to bring the comfort and performance long associated with the PowerShell 5 boot to the sport’s leading mechanical release system. A specially designed injection molded piece connects the PowerShell boot to the Reflex toe bar, and an added rear heal cleat secures the boot to the mechanical release. The PowerShell/Reflex pairing will come standard mounted to a G-10 carbon plate and will also feature a rear half-boot option. PowerShell boots have long been know for their comfort and performance, powering countless world and national records and serving as the boot of choice for some of this generation’s best skiers, including Regina Jaquess and Thomas Degasperi. A "half-boot" rear option is available. I made the switch from the Power Shell 5 System to the Reflex System three years ago to could get a more consistent release than what the dual lock could provide. However, performance was something I always felt I was giving up using the Reflex Hard Shell boot. Now with the introduction of the Power G-Flex Hard Boot System, I’m no longer sacrificing anything. 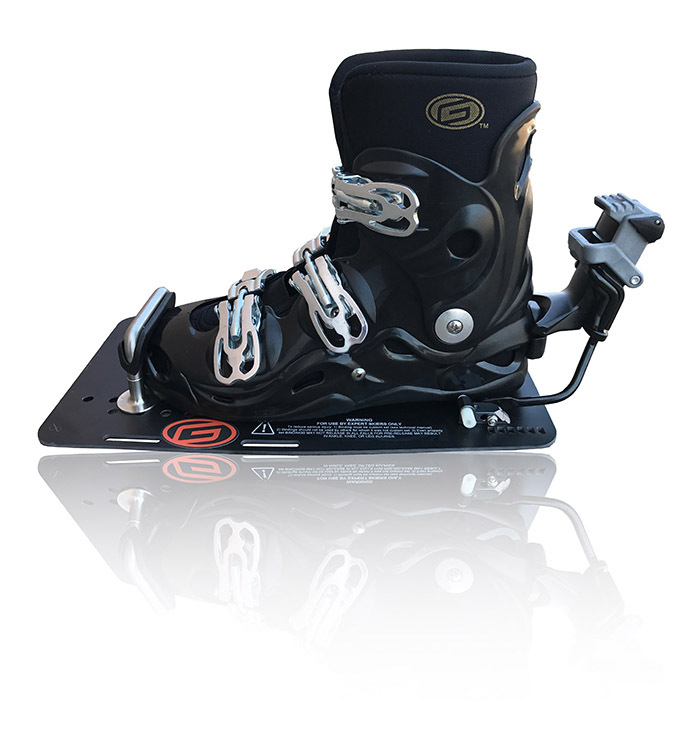 I skied 2@41 straight up the line on my first set using the Power G-Flex System. I immediately noticed I was able to get more angle creating greater space into the buoys resulting much easier passes. If you are looking for the best most forgiving hard boot system in the market, the Power G-Flex binding system is the one to order. Just wanted to let you know. Stephanie showed up this weekend to our event and had just put on her new boot. She had been riding the same old hardshell for over 10 years. She told me she wasn't dialed in yet and that she wasn't sure about it. She then ran 35 off 4 out of 5 rounds which is by far the best she has ever skied, tying her PB of 2@38. I think she is convinced now. She looks so much better and her ski looks like it can move out more freely. Click the button below to add the Power-G-Flex™ Hard Shell Boot System to your wish list.